Inshore water temperatures on the north end of the Grand Strand have dropped to around 47 degrees, and with gin clear water, mild conditions and a still-very strong bite it can be one of the most satisfying times of the year to fish around Little River. 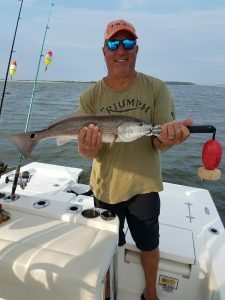 The inshore redfish bite has been strong for nice fish on the smaller end of the slot, and Captain Patrick “Smiley” Kelly (843-361-7445) reports that his boat has been catching a lot of 15-18 inch fish. Chiefly they are catching them in shallow water 2-3 feet deep for a couple of hours each side of low tide. Gulp! as well as cut shrimp on a ¼ ounce jighead have both been working well. 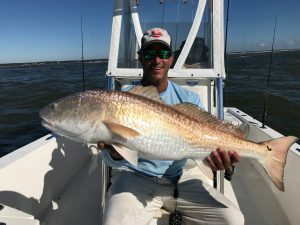 The bigger redfish can still be found in the Inlet around the jetties, but with such a good bite inshore it’s been hard to leave. The trout bite is still excellent, and on moving tides around ledges in 6-8 feet of water Patrick’s boat has been catching impressive numbers of trout (as well as some very nice ones) on live shrimp, Vudu Shrimp, and Mirrolures. Black drum have also been caught on the same pattern as the trout with either live or cut shrimp. Inshore water temperatures on the north end of the Grand Strand have dropped into the mid-60s. Without a doubt this is the best time of the year to fish the Little River area, and Captain Patrick “Smiley” Kelly (843-361-7445) reports that the big pre-winter feed is in full swing. The trout bite is as good as it gets, and some nice fish in the 3 plus pound range have been caught recently. Trout are holding on ledges and drops in 6-8 feet of water, and the tide doesn’t seem to make a big difference as long as it’s moving. Live shrimp, Vudu Shrimp, Trout Tricks and ZMan baits have all been working. Redfish are also on the move and feeding, and lots of fish in the 15-30 inch range are being caught. Reds can be found anywhere from the flats to drop offs to deep holes, and the area you want to fish is dependent on the tide. There are also a good number of slot-sized fish being caught around the jetties, although the bigger bull drum are phasing out. Despite it being almost the middle of November some really nice flounder are still being caught, and in the recent Captain Smiley Inshore Slam out of Cricket Cove Marina on Saturday there were a couple of five plus pound fish brought to the scales. The best action has been around lower tide in deeper holes inside the creeks, and both finger mullet and Gulp! baits have been working. Sheepshead are plentiful for anglers who target them, and there are even some sheeps being caught on Captain Smiley’s boat on live shrimp in the shallows. Cherry Grove Pier (843-249-1625) reports that fishing has slowed in the surf zone, and the catch now is limited to some whiting, croaker, spots, small flounder, and occasional redfish. Captain Smiley reports that the first annual tournament was a big success with 46 boats, and he would like to thank all the sponsors as well as the winners – particularly the overall winner Clay Morphis on the boat Pork Chop. A 5.40 pound flounder and a 4.74 pound speckled sea trout anchored his 12.56 pound slam. Inshore water temperatures on the north end of the Grand Strand have dropped to around 69-70 degrees; water clarity is still pretty low. 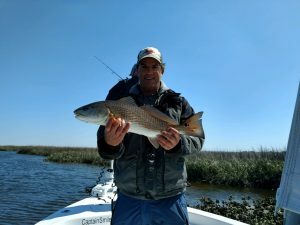 It’s a very good time to be fishing on the north end of the Grand Strand, and Captain Patrick “Smiley” Kelly reports that in the Little River area they have been doing really well for redfish. 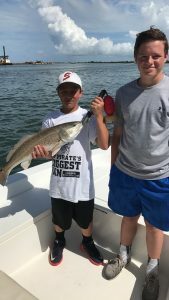 Plenty of over the slot red drum have been caught, and on calmer days when you can sit in the inlet if you put in the time you will catch a big one. Inshore plenty of 24-26 inch reds are being caught on finger mullet fished on a ¼ ounce jighead, with the last hour of the outgoing and then the incoming tide best. Flounder have been picked up also fishing the bottom of the tide and then the incoming, and again there are a mix of small fish and keepers. In addition to finger mullet on a ¼ ounce jighead flounder (and reds) will also take Gulp! baits. Black drum have been biting pretty well on the incoming on shrimp fished on a ¼ ounce jighead, while trout fishing has been a little off but should pick up soon. Cherry Grove Pier (843-249-1625) reports that off-and-on for the last ten days there has been sporadic spot activity, and there have also been some nice whiting, croaker and pompano caught as well as small black drum. Despite menhaden so thick you could walk on them there have been relatively few bluefish and Spanish mackerel around. Flounder fishing has been poor as with the beach renourishment oxygen levels on the bottom are bad. A 14 ½ inch weakfish was also caught today. Note that there will be an inshore fishing tournament and festival November 4 out of Cricket Cove Marina. For more information check out http://www.captainsmileyinshoreslam.com/. Inshore water temperatures on the north end of the Grand Strand have dropped and range from the low 80s in the creeks to about 77 in the surf. The water is very dirty. 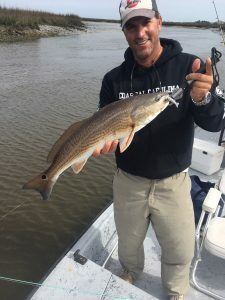 The bite hasn’t changed a lot since the storm even though the water has gotten dirty, but there have been decent numbers of small redfish caught inshore – before the storm they were a little hard to locate. Captain Patrick “Smiley” Kelly reports that his boat is now catching them in very shallow water throwing ¼ ounce jigheads with live mullet, live shrimp or cut mullet. Trout and flounder are still being caught, and the bull drum are being caught on dead high tide near the Little River jetties. Cherry Grove Pier (843-249-1625) reports that there are lots of reds and black drum being caught off the pier in only 3-4 feet of water, with the reds running generally 30-35 inches. Plenty of 10-15 inch bluefish are around as well as the usual croaker, whiting and perch. There is a king mackerel tournament off the pier this weekend. Inshore water temperatures on the north end of the Grand Strand are in the mid-80s, and water clarity is poor after a lot of recent rain. 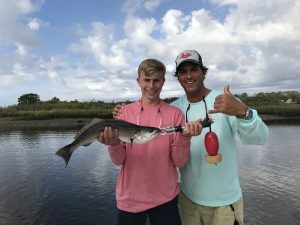 It’s starting to feel like fall, and Captain Patrick “Smiley” Kelly reports that right on cue the larger redfish are starting to school up in the Little River Inlet. Mullet are running up and down the beaches, and as a result there are plenty of reds ranging from the larger end of the slot up to about 36 inches. They will eat both mullet and menhaden. Inside the creeks the redfish have been tough to locate recently. 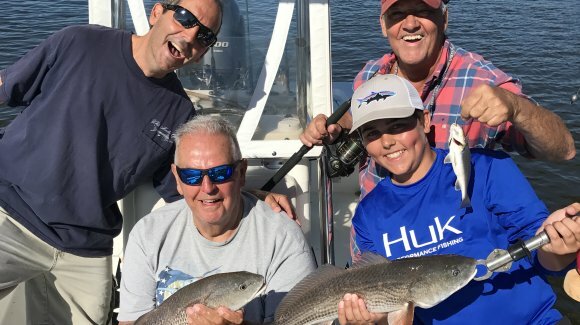 There is still a strong trout bite, and on the rising tide action has been pretty consistent with live shrimp fished under a popping cork. Fish are in 3-10 feet of water around points, drops and ledges. There are also a tremendous number of snapper bluefish in these same areas, and right now it’s a pretty safe bet that if there are either trout or bluefish in an area the other species is also present. Flounder fishing has been good on the outgoing tide with live mullet fished on the bottom. The fish have been in deeper holes with about 10 feet of water. The black drum bite has also been strong, with fish caught around Tillman’s Docks. Fish are biting live or fresh dead shrimp on the outgoing tide. Cherry Grove Pier (843-249-1625) reports that whiting, croaker, a few pompano, a few black drum and some spadefish have been caught off the pier. There are some nice-sized Spanish mackerel around but kings have not returned since April. Inshore water temperatures in the Little River have risen into the mid- to lower 80s, and clarity is good. Inshore fishing on the upper Grand Strand continues to be very strong, and Captain Patrick “Smiley” Kelly (843-361-7445) reports that his boat is still catching a mix of species. The best bite has been for trout, and recently there has been an exciting topwater bite first thing in the morning (and late) when fish will eat Zara Spooks, Mirrolure Top Pups, and other topwater walking baits. You need to move the bait slowly and then pause it, and the fish will be in the shallows. Instead of looking for any particular type of cover or structure the key is to find areas where mullet are showering – indicating feeding fish. Trout can also be caught on popping corks with live shrimp. Tubbs Inlet, the Little River Inlet, and Dunn Sound have all been producing. Ladyfish, which often inhabit the same areas as trout, will also be caught on topwaters as well as popping corks. 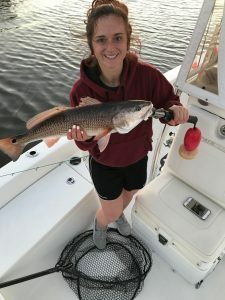 It’s also possible to pick up some redfish while fishing topwaters, and there also some nice 20-23 inch fish being caught along the grass on cut mullet when you catch the tide right. 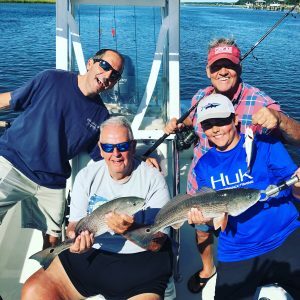 Bigger reds over the slot can be caught at the jetties. Black drum have been feeding well, and this week Captain Smiley has been catching them mostly on the incoming tide. The best bait has been a live shrimp hooked through the legs up to the head on a ¼ ounce jighead, and fish can be caught jigging along the bottom in deep holes. There has also been a good flounder bite in holes as well as around sandy bottoms, and both Gulp baits as well as small finger mullet (prolific in the creeks) fished on a ¼ ounce jighead are working. Fish have ranged from 12 inches up to some nice ones in the 20-inch range, and recently the incoming has been productive.